(Phys.org)—Toshiba may be targeting the end of 2013 for the launch of a new camera sensor for smartphones and tablets, where the picture taker can choose a specific area of focus in the photo after having taken the photo. Photography enthusiasts as well as all creative picture-takers will be able to manage how they want the photograph to tell the story, allowing for managing the focus after the fact. This resonates heavily with the Lytro light field camera, which was introduced as a way to allow photographers to shoot the image first and focus on the subject later, thinking about focus points during the editing process. 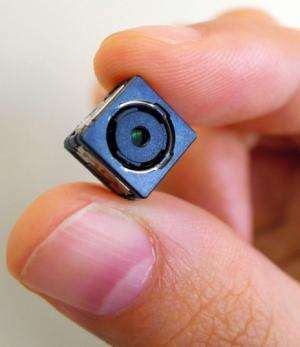 The Toshiba sensor is a departure from Lytro, however in size; Lytro is marketing cameras about the size of a palm. Toshiba's package is smaller than Lytro's longer body. The Toshiba measurements indicate it is suitable for a smartphone. When the sensor launches, users will also be able to work with videos shot on the smartphone or other device. The cube-shaped module is about 1 centimeter per side. About 500,000 small lenses go to work, each about 0.03mm in diameter, each grabbing a slightly different image. Then all are combined into one, with the use of Toshiba software. The Toshiba mechanism works similar to the way the compound eye structure functions in insects. Reports say Toshiba 's next step is to look for smartphone and tablet manufacturers who will want to adopt its sensor technology. The Asahi Shimbun carried the report earlier this week. Toshiba is said to be planning to commercialize the module by the end of fiscal 2013. The Lytro, a creation of Lytro company founder Ren Ng, is the result of Ng's work on the camera when he was at Stanford, and his product drew attention as a shoot now focus later camera representing "light field technology." The Lytro technology spread awareness of how the focal point of a digital image can be changed after the picture is taken, for example, where it is possible to shift the focus from a subject in the foreground to a subject in the background. Alas, light-field photography is not as magical as it sounds. In the end, you have a very low-resolution image equivalent to some of the earliest consumer digital cameras of ten years ago. It makes a nice toy for social media, but if you plan to print and frame, not so much. IMO, go for megapixels and quality glass, especially if you plan to crop your image at all before enlargement. For my smartphone camera, I'd rather they develop a good optical zoom. A german firm Raytrix working on Lightfield sensor technology have overcome this hurdle now and their is no longer any loss of resolution. Might take a few years to filter through though. In the end, you have a very low-resolution image equivalent to some of the earliest consumer digital cameras of ten years ago. I don't agree. Most pictures from smartphones are low resolution anyway, mainly due to the lack of a proper focus and due to their very bad noise to signal ratio. Their effective resolution is always much much lower than their nominal resolution ("megapixels") and they very rarely achieve more than 1 effective megapixel, those lenses are simply too small. The ability in the new sensor to dedicate a bigger area of the sensor for each pixel (and a dedicated lense for each one), and the new ability to refocus later could be very good for smartphones and in fact it can provide bigger effective resolution in most situations. I find that its hard to shoot with any zoom with a phone cam, because my hand always shakes a little. Image stabilization is top on my list. @Mayday : I saw the first examples of this imaging system too, but Toshiba's is no doubt an improvement over that. Half-a-million little lenses? Also, image quality is a function of CCD image sensor size, not number of pixels, and no doubt that is also being looked into by Toshiba.